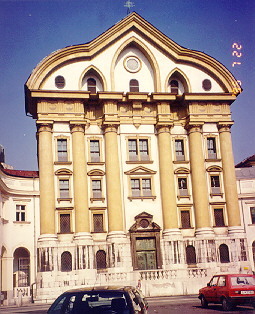 The Ursuline Church was built in 1718 to 1726 and is the most beautiful Baroque work in Ljubljana. The architect is unfortunately unknown but the church is a model of Palladio's Church in Venice. In the interior of the church there is a high altar made of polycoloured African marble. The altar was made by Francesco Robba, who also made The Robba Fountain. In the church there are works of Valentin Metzinger and by the Ventian painter Palma the Younger. The church belongs to the complex of the Ursuline nunnery. The order of St Ursula is one of the later Roman Catholic women orders and was established in 1535. The nuns devoted their time to painting. The church is decorated with some of their works of art.